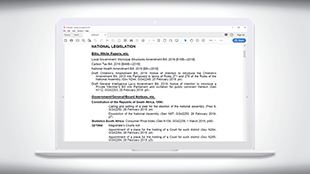 LexisNexis Provincial Legislation is a comprehensive collection of consolidated and annotated Acts assigned to the provinces and Acts, ordinances and regulations of the 9 provincial legislatures. 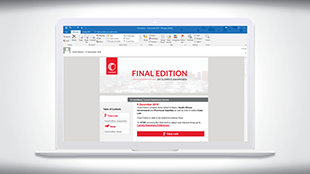 It is available in two formats, online on Lexis Library or as a print loose-leaf. The online solution is updated daily and the loose-leaf twice a year, with complementary updating services. 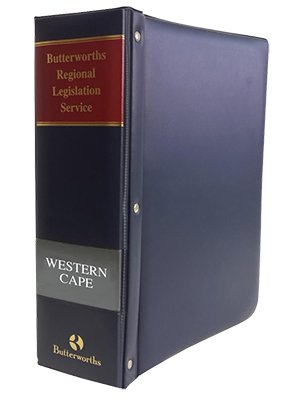 Comprehensive collections of current consolidated Acts and Ordinances of the provincial legislatures, Acts assigned to the provinces and Regulations - available separately for each of the provinces (excl Eastern and Western Cape – which are online only). They provide separate binders for Acts, Ordinances and Regulations, each grouped under subject titles. Principal Acts, Ordinances and Regulations appear in full with all amendments incorporated and fully annotated. Amendment Acts are presented in a summarised form. There are alphabetical and chronological tables of Acts and Ordinances cross-referenced to subject titles with details of all repeals and assignments. Each province has an A4 loose-leaf service housed in 4-7 binders, updated with replacement pages. A quarterly consolidated Bulletin updates you on the latest provincial legislation, such as new, amended or repealed Acts and notices, Bills and White Papers, etc. listed by province. A daily e-mail alert service that updates you on the latest News and Case Law. Published each weekday, Current Awareness allows you to tailor your subscription preferences so that you receive the most valuable content to you. Subscribers are provided with updates on the latest News and Case Law, with links to full version of this case law, on Lexis Library. Designed to analyse the precedential value of cases you’re researching, Legal Citator will reduce research that might otherwise take hours, to mere minutes. Canvassing five series of law reports and all the cases cited within each judgment, Legal Citator has over 90 000 interlinked cases in constant, dynamic, analysis and generates a Case Analysis report on each. to keep you informed on all new legislation.